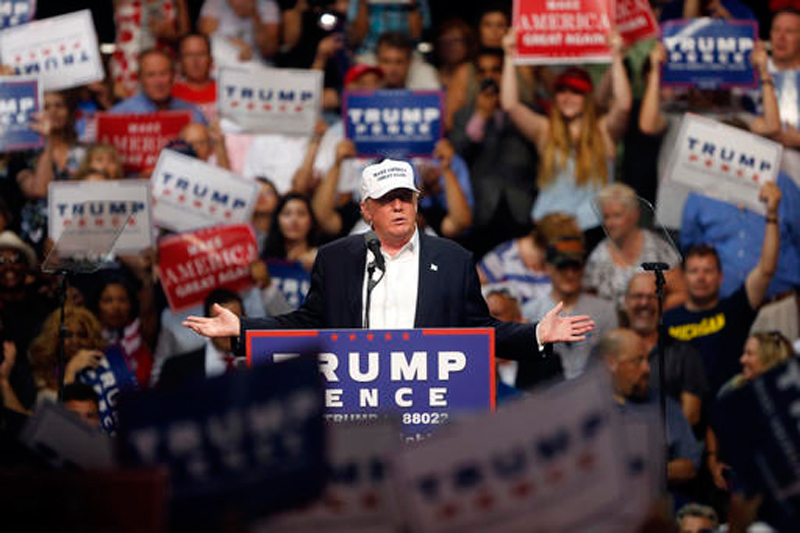 DIMONDALE, Aug 20: Republican Donald Trump again made a direct appeal to black voters Friday night, urging them to abandon the Democratic Party and give him a chance. Speaking at a rally in Dimondale, Michigan, an overwhelmingly white suburb outside of Lansing, the GOP nominee argued that Democrats, including his rival Hillary Clinton, have taken advantage of African-American voters and taken their votes for granted. "Tonight, I'm asking for the vote of every single African-American citizen in this country who wants to see a better future," Trump told the crowd. "What do you have to lose by trying something new, like Trump?" he asked them. "You're living in your poverty, your schools are no good, you have no jobs, 58 percent of your youth is unemployed — what the hell do you have to lose?" He also made a bold prediction: "At the end of four years, I guarantee you that I will get over 95 percent of the African-American vote. I promise you." Most polls show Trump trailing Clinton significantly among black voters. President Barack Obama won roughly 93 percent of black voters in his re-election campaign in 2012. But Trump once again accused Clinton of "bigotry," claiming she sees African-Americans "only as votes, not as human beings worthy of a better future,"
And he painted a dismal role of life for African-Americans in the workforce, declaring that, in cities like Detroit, they "have become refugees in their own country." On Twitter, the Clinton campaign responded, "This is so ignorant it's staggering." The Clinton campaign's Marlon Marshall added in a statement: "Donald Trump asks what the African-American community has to lose by voting for him. The answer is everything from a man who questions the citizenship of the first African-American President, courts white supremacists, and has been sued for housing discrimination against communities of color." Marshall said, "Trump painting the entire community as living in poverty with no jobs continues to show he is completely out of touch with the African-American community."